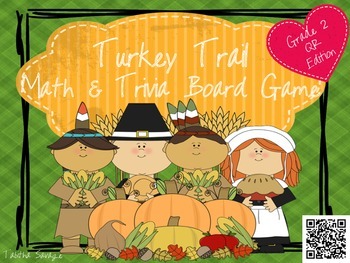 Turkey Trail- A Math and Thanksgiving Trivia Board Game Gr. 2 QR EDITION! 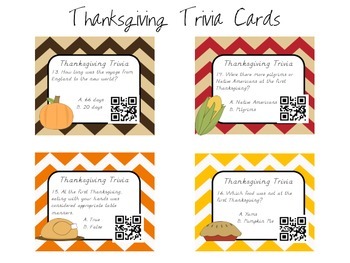 Turkey Trail Board Game QR edition is an exciting way to review grade level math standards and learn a bit of Thanksgiving trivia along the way! 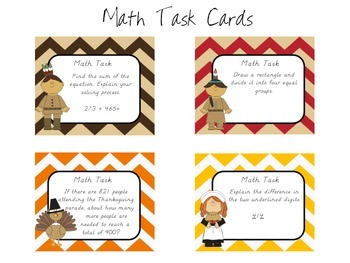 Students race around the game board with Thanksgiving character game pieces, roll the Turkey Trail dice, solve a variety of math tasks, and answer fun trivia. The first player to reach the finish line wins! QR Code is a matrix barcode (or two-dimensional code), readable by QR scanners, mobile phones with a camera, and smartphones. To use the codes, your iPhone, ipad, or IPod will need a QR reader from the app store. These are free and there are many to choose from. Once the QR reader app is downloaded, use the camera on the device and scan the QR code. It can show you a picture, take you to a website, or reveal a secret message! QR codes not for you? 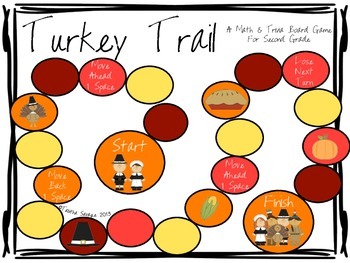 Click here to see Turkey Trail Gr. 2 without QR codes!